Gently massage with finger tips using upward and outward strokes all over face & neck. Remove with moist cotton swab or wash thoroughly with plain water and pat face dry with soft towel. Wheat Germ oil, Almond oil, Olive oil, Marigold oil, Turmeric oil. Jovees 24 Carat Gold Facial Scrub will help reveal a smoother, clearer and youthful skin. It contains delicate granules that penetrates deep into the skin to clean, wipes-away spent surface cells and helps remove dead epithelial cells. This process leaves skin looking soft, smooth and supple with a healthy glow. Apply sufficient quantity all over face and neck. Massage gently for 2-3 minutes upward and downward strokes. Wash off with plain water. 24 Carat Gold Leaves, Rose Water, Aloe Vera Powder, Gold Leaf, Jojoba beads, Wheat Germ oil, Grape seed oil, Purified Water q.s. Jovees 24 Carat Gold Massage Gel penetrates the skin easily and helps to accelerate the regeneration of new cells, while delaying the formation of lines and wrinkles. A powerful rejuvenating massage gel that also helps improve blood circulation and restore softness, smoothness and radiance. Massage gently Gold Gel into the face using upward and outward strokes. Use once a day for youthful and flawless skin. Use Gold Moisturiser after the massage. 24 Carat Gold Leaves, Aloe Vera Gel, Wheat Germ Oil, Grape Seed, Liquorice, Morus Nigra, Purified Water q.s. Jovees 24 Carat Gold Moisturiser contains pure gold leaves along with precious botanicals and essential oils, which helps to restore the moisture balance to the skin and improves skin's elasticity. 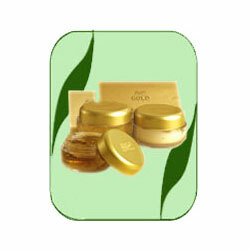 After massaging with gold gel, gently rub a small quantity all over face and neck for youthful and flawless skin. Aloe Vera, Wheat Germ Oil, Grape seed, Purified Water q.s. Jovees 24 Carat Gold Face Pack is an exclusive and powerful facial pack which helps to accelerate the regeneration of new cells, improves skin elasticity, rejuvenates the skin and slows visible signs of ageing, reduces the appearance of lines and wrinkles giving skin a clear matte look. It also helps to bring glow and visible radiance to skin. Apply a thin layer evenly all over face and neck and leave on for 30 minutes. Wash thoroughly with plain water. 24 Carat Gold leaves, Aloe Vera, Wheat Germ Oil, Tangerine, Purified Water q.s.